I specialise in soft bohemian style wedding dresses. Firstly, I confess to absolutely loving what I do! I design and make my soft bohemian style wedding dresses using only silks and the softest of French Laces. I take pride in the quality of how a dress feels as well as looks. My current collection is a little more minimal and modern. Still Boho but with a slightly cleaner line. I have tried to create a few unique looks. I have a wealth of experience that has grown over the years from meeting and designing for many, many brides. I like to see my work as a craft, developing my creativity and progressing my skills. This is the fabulous thing about what I do, there is always so much more to inspire me. I specialise in soft bohemian style wedding dresses. I love to design romantic unstructured wedding dresses. My collection is for the bride who wants a very special unique dress that reflects her style and originality. I have curated shapes from my bespoke designs, shapes that have been tried and tested to flatter and inspire. It has really helped to work directly with my brides. I have learned along the way how to fit and flatter all shapes and sizes. Studying Fashion Design at a young age and passionate from the start. The creative process of learning a skill and dreaming ideas was a true inspiration. An inspiration that burns still. 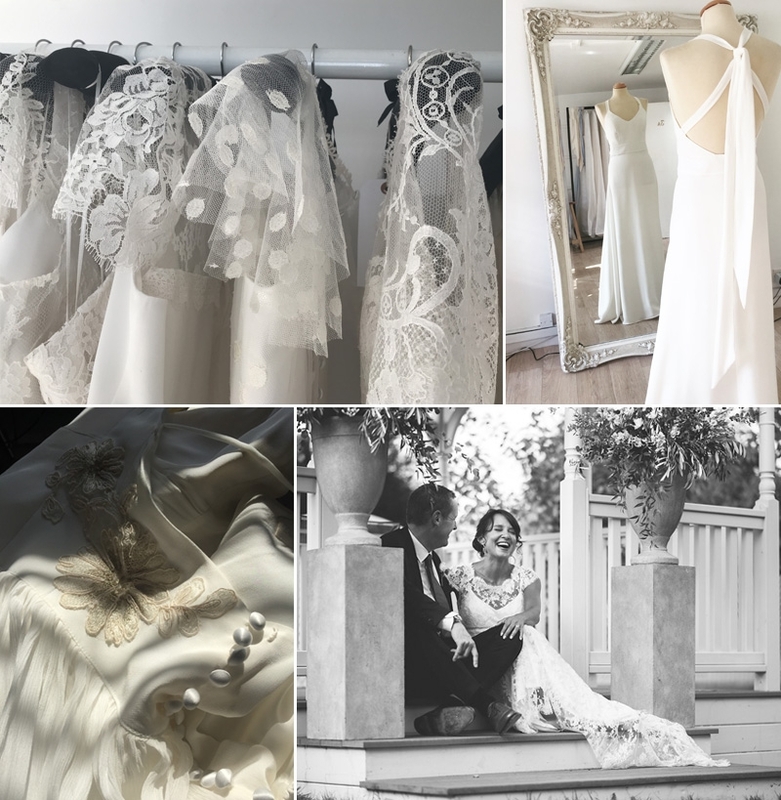 I started my bridal business from a few commissions whilst I worked with stylists and costume designers, film and television kept me busy. It was a frustrating experience though. Although I made some really lovely and exciting pieces they were not my designs. I found my creative home in bridal wear some years ago. I work from a studio in Muswell Hill North London. This is my showroom as well as where I dream up the dresses. A haven of peace and pretty dresses! When I walk through the door of my studio I feel a calm peacefulness. This is my space where I can make my dreams come true! I am incredibly proud of my lovely dresses. A small intimate showroom for you to try on my ever growing collection. Many of my brides are fairly local or are in London. Its amazing when I find that a new client only lives around the corner from my studio. Previous and current commissions have come from as far flung places as Kuwait, Australia, Czech Republic, Italy. Travelling from Ireland, Scotland well anywhere, can be accommodated into your timeline to allow for fittings. I recently sent a Mercy sample sale dress to Australia. This very inspired bride bought the dress from pictures only. I am happy to say that not only did it arrive safely but fitted perfectly, no adjustments needed. I love it when, finally, after the wedding the pictures arrive ( I often hear of other arrivals a year later too!) It is, after all, an industry based on an incredibly special and deliriously happy event.